Azure Resource Manager policies provide you with the ability to manage risk within you Azure environment. You can write policies to enforce certain situations. A policy setting is default set to allow. Policies are described by policy definitions in a policy definition language (if-then conditions). You create polices with JSON formatted files. Audit: Allows the request but adds a line to the activity log. These can be used to start action within Azure Automation. Append: Adds specified information to the resource. For example tagging the resource with useful information. I started to create Azure Resource Manager Policies and created a GitHub repository to save them and share them. 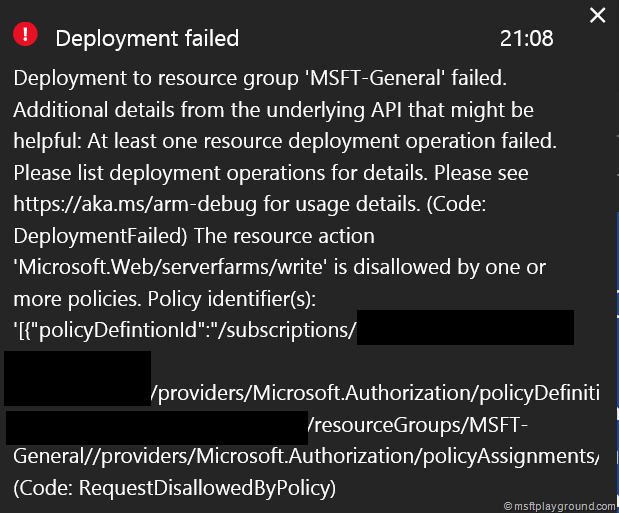 Within this repository you have the option to add policies and work together on them to get a default set of policies. The repository also contains a script files to assign the policies to specific resources. One of the policies within the repository is a policy to ensure that resources are created within the Europe regions. The policy is described in if-then conditions, if the resource is not created in West-Europe (westeurope) or North-Europe (northeurope) the creation of the resource will be declined (deny). In the policy file the schema file specified to get type-ahead functionality within JSON editors. With the first command the definition is created, and saved to a PowerShell object. 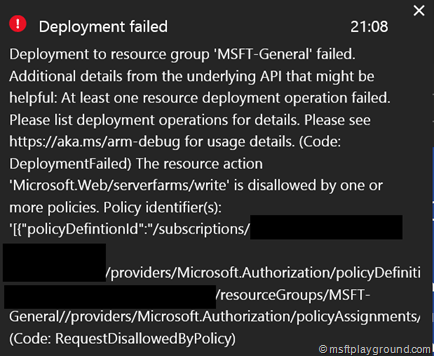 The second command is then used to assign the policy to a certain scope. Putting everything together and making the script as generic as possible you have the following script to assign a policy to a resource group. $policyDescription = Read-Host "Specify the description of the policy"
Write-Host "Policy is applied to the resource group: $resourceGroup in subscription: $subName"
New-AzureRmPolicyAssignment -Name $policyName -PolicyDefinition $policy -Scope "/subscriptions/$sub/resourceGroups/$resourcegroup"
After assigning the policy and trying to create a resource in another region will result in a error message. Sometimes this can still be a really descriptive message as shown in the image below. Hope the scope above is correct?